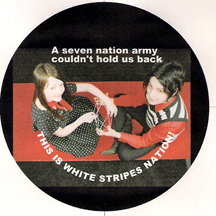 This Is White Stripes Nation "Seven Nation Army"
MANIFESTO I: "Seven Nation Army"
Greetings, Comrades. This is a communique from Generalissimo Alberto Barger regarding the present crisis. The current administration is an abject failure. The Bush regime is weak, and incapable of Decisive Action. Doing the denial twist in the cold, cold night is insufficient. The People demand change. A state of emergency exists. Therefore, martial law is hereby declared. A directorate of The People has taken over, and a new executive has been chosen. We must have a real leader, someone with a track record of real achievement who could impart the required principles of leadership and tradition. On careful examination, The People see that there's only one person fit for the task, a man of achievement equal to the job- a man with a genuine sense of geometry and theology. Legendary Monkey: Al, honey, no. Haven't you realized yet that your fascist ways convince no one? We have to approach this democratically, using logic and reasonable debate. Folks, you just can't mind Al. They haven't invented a medication yet that we can feed the big fella. GA: Democracy has been tried and it has failed miserably. What in the world makes you think that average imbeciles have enough sense to run a country? They don't have enough sense to pick out a record collection. Do you think that people buying Coldplay and Mariah Carey records have any business making life and death decisions for the nation? LM: I see through your weak attempt at distraction, and will not allow my disdain for anyone who likes Coldplay to influence my belief in a basic democratic system. Fascism isn't going to make us any friends here. GA: We don't have time in the current situation to hold their hands and sing Kum-Ba-Frickin-Ya- they need only submit. Surely you can see that the Bush regime is weak, an abject failure. I think we can certainly agree that President Bush must be taken out and put to the lash immediately. LM: I've been telling you that for years. If you'd listen to anything I said for half a moment, you'd have been singing this particular tune back in the day when it was fresh. You're jumping on my bandwagon and you're distracting me. Anyway, Jack White isn't going to be appointed to anything but my... I mean, we're going to have to elect him. Finis. We will present the truth of the brilliance of the candy cane duo, we will use your vast musical knowledge and my fuzzy charm to persuade, and we will rationally convince everyone that the White Stripes are the best big name band producing music today, and if you don't shut up about your junta, I am going to stuff my monkey's paw where the sun don't shine and clean out your backed up plumbing. We are talking severe consequences here, Albert. There may be cannibalism. GA: Eek! I submit! I SUBMIT! I fear your monkey wrath more than Bin Laden. If you insist on persuasion and negotiation, perhaps we can give the people some limited opportunity to voluntarily choose the inevitable. If you wish to make this process of establishing our rulership a Socratic dialogue, we can certainly argue a good case for Jack White the philosopher-king. That should be easy. And if that doesn't work, I've arranged for a seven nation army to do the right thing and install Jack as El Presidente. 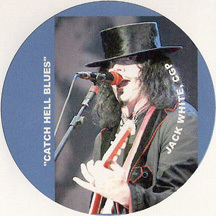 GA: Yes, Jack White is a bold visionary political statesman. "Seven Nation Army" provides the blueprint for the revolution. Every revolution needs a blueprint. Mao wrote the classic little red book, and Jack White wrote "Seven Nation Army." Yeah, Mao was pretty successful with his little book, but if he'd had a marching beat like the bassline that Jack dredged up from his inner ubermensch here, them Chi Coms would have marched right across the Pacific and actually captured Pearl Harbor instead of just blowing it up. We'd have been in serious trouble. Fortunately, glam was still decades away. Strange thing is they make such bloody good cameras. Breaking down that White Stripes voodoo, Elephant was their British album, recorded in England and showing a lot of English influence. Looking at Jack's genius through that frame, he led his album with a classic 70s glam slam that Marc Bolan would have been proud to claim for T Rex. LM: Indeed, Elephant is the "British" album, as English as bangers and mash. 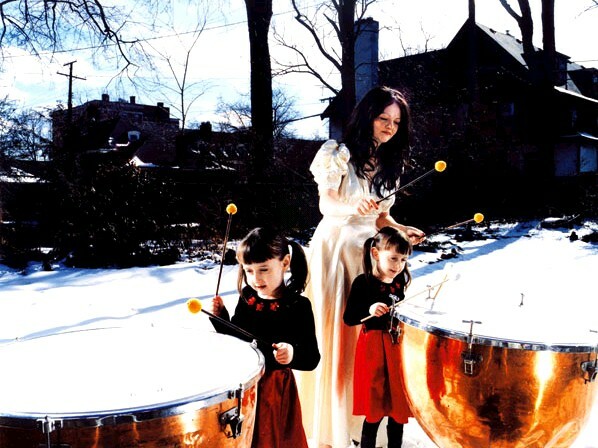 But "Seven Nation Army" proceeeds carefully; the White Stripes start out slowly, with what sounds like a heavy bass line (but which actually comes courtesy of a seven string guitar handled with technical finesse). But it's slow, repetitive, simple -- a toned down sound that is familiar to fans who've heard Jack and Meg's eponymous debut, De Stijl, and White Blood Cells. The guitar resonates, solo, and then Meg comes in with the drums and the song builds from there. The vocal slips in, measured, musical spoken word. Meg adds an extra layer to the beat, and then the song builds to a crescendo that is in fact reminiscent of the best of glam rock. It's a neat trick, effectively bridging Elephant with the albums that came before. The British influence has always been there, but subordinate to the blues and punk riffs. With Elephant, that balance is reversed, and "Seven Nation Army" is a masterful introduction to the change in tone. LM: Though I'm not sure I agree about this song being the lynchpin of Jack's platform... no matter, we'll get there. I can feel our movement gaining support from this rational argument! Even a Nickelback fan could understand this, maybe. Isn't this better than killing and mayhem? GA: No. When the people take power, Nickelback fans will be lined up against the wall and shot. Whining counterrevolutionary losers caught with Radiohead CDs will find themselves being re-educated at Gitmo. Then there's Abu Ghraib, or as it will soon be known, "Camp Mimi". LM: Hush, you. I think Radiohead is okay, at least. But back to the topic at hand! This is indeed White Stripes Nation... or could be, even perhaps should be -- and Al Barger and I are going to prove it to you, one song and one vote at a time. We will outline the influences that helped shape our beloved White Stripes, as well as their vast musical talents, presented across generations and outlooks. Al and I are pretty disparate individuals, and if we can agree to... well, agree, then perhaps everyone can! GA: Does this mean our "people's committee" is accepting advice and consent from the blog community? LM: Anyone can join the movement, but the movement waits on consent from no man, blogger, or primate. You can't stop the movement. Viva Democracy! And long live El Presidente-to-be, Jack White, and his filthy assistant, Meg White (with apologies to Warren Ellis and the inimitable Transmetropolitan). LM: Okay, Al, whatever you say. The people's committee presents White Stripes Nation, an examination of a carefully chosen list of songs by said duo. Pure White Stripes, and a look at the influences what built them, the ways in which they connect to other songs and albums, and all the reasons you need to start loving the band right now. "Seven Nation Army" is only the first of perhaps two dozen songs for your consideration in establishing Meg and Jack's fitness to rule.